Dark chocolate with fruit centres (28 %). Suitable for vegetarians.Indulgent fruit centre delicately coated in rich, smooth dark chocolate Green & Black's create delicious ethically sourced chocolate from the finest ingredients. Our Taste Specialists have crafted this dark chocolate using the delicate character and soft texture of the finest Ghanaian cocoa balanced with sweet Madagascan Vanilla. 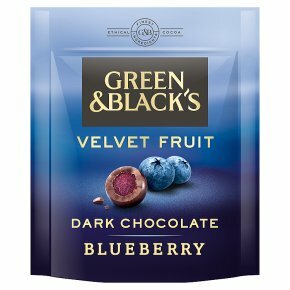 Velvet Fruit expertly combines Green & Black's smooth dark chocolate with a real fruit centre; the mouth-watering taste of blueberries balances perfectly with the rich chocolate, bringing a uniquely indulgent chocolate experience.